Today we are going to go over another classic Pokémon. I think it's a good week to talk about Nidoking. That... and... I've been listening to a lot of Jay-Z. Not sure where the relation comes in with these two. Much larger than their previous evolutions, Nidoking now have the ability to stand on their hind legs. Unlike his pre-evolutions, Nidoking is purple instead of fuchsia, and he does not possess spots. Nidoking’s most prominent feature is its large, pointed, venomous horn which it uses extensively for battling purposes. Nidoking’s ears have small pointed extensions on the tips, and the insides of its round ears are green-colored. Nidoking have five teeth on each side of their lower jaw, the fifth protruding out of the jaw and thus visible when its mouth is closed. Nidoking’s eyes are shaped like scalene triangles, and there is fur growing off the bottom of his jaw. The spines growing down Nidoking’s back are extremely large, as is its tail, which is decorated with several thin stripes. Its chest and abdomen, gray in coloration, seem to be quite muscular. 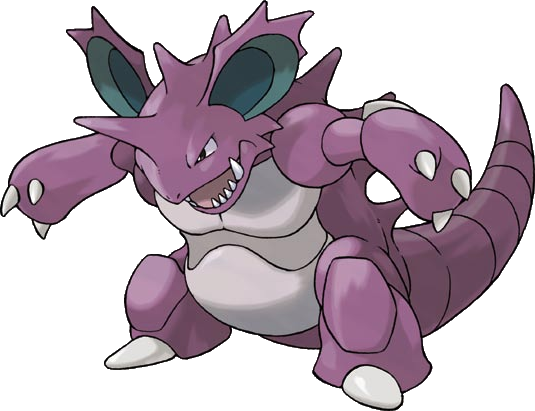 Nidoking has white-colored ridges on its three-clawed arms and a single, large, hoof-like toe. Nidoking and its female counterpart Nidoqueen share the same species name with Rhydon and Rhyperior. They are all known as Drill Pokémon. Coincidentally, all four are also Ground-types.